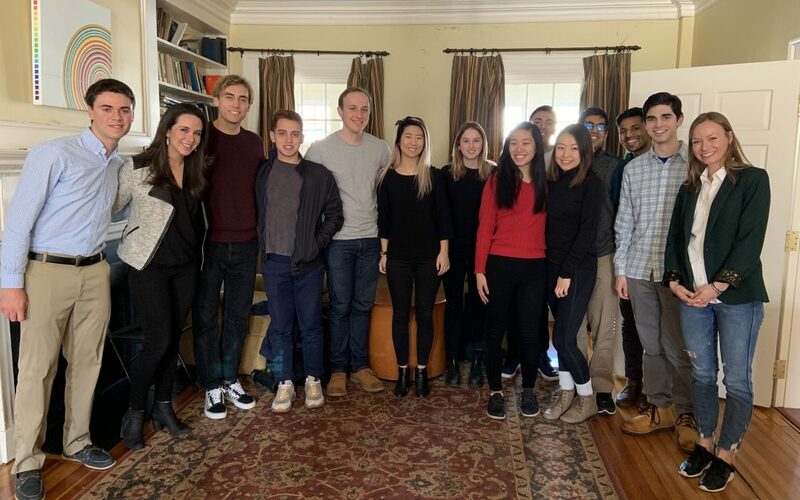 On March 6, 2019, The Nelson Center for Entrepreneurship and Brown EP proudly hosted Laura Thompson ‘09 for a roundtable discussion as part of the Roundtable Discussion Series moderated by Chuck Isgar ‘20.5. Thompson shared lessons learned through her journey leading the growth of Google X. When Thompson first came to Brown, she thought she would concentrate in applied mathematics. She approached her time at Brown as a way to take engaging classes, and many of these courses lay in the realm of entrepreneurship. She ultimately graduated with a degree in public policy, but not before successfully launching Runa, a tea company with a social mission of providing opportunities for Amazonian farmers. After doing some work in London with Google’s budding consumer electronics group, Thompson joined Google X, Google’s “moonshot factory”. Thompson was a unique addition to Google X as she represented an early non-engineering hire for the team. When she joined, there were four projects in the works under the Google X umbrella: one being self-driving cars. And you’re probably wondering about those other three? Well, as much of her work at Google X, it was secretive. So, what was a public policy major doing as one of the few non-engineers on a team trying to solve complex technical problems, ranging from combating climate change to the future of robots? Thompson shared that the fact she wasn’t an engineer is actually what made her so valuable at Google X. For example, Thompson helped teams think about the human consequences of their work and what it would take for projects to land successfully in the real world. There is a growing need in technology to prioritize human-centered design and Thompson is pleased to see this movement progressing. Along these lines, Thompson explained that they thought about sustainability at every level of the project and ideation process in her time at Google X. The goal at Google X is to create a culture of innovation that leads to development of ideas for the future. At first, Google X thought that the way to achieve the most success would be to have everyone together. Over time, they realized that this model wasn’t sustainable. Thompson was part of the transformation from the ‘everyone-in-a-garage-mentality’ to a more sustainable model where each project gets spun off and has its own business model, while still being under the Google X umbrella. To the budding venture capitalists in the room, Thompson shared a framework that they commonly utilized at Google X when deciding which new projects to undertake. For each potential project, they would make a list of all the reasons the project would be an epic failure. As the team worked on the project and overcame the challenges, they would cross them off the list. If a project could overcome one quarter of their challenges, the project would likely be a go, as the team had proven they have the ability to overcome the difficulties that will surely present themselves along the way. Thompson explained another rule of thumb used at Google X when evaluating new projects: “is this going to affect one billion people in a meaningful way?” This message resonates closely with the Nelson Center for Entrepreneurship’s mantra: create solution with impact. Despite the best intentions, many successful innovations come from random, happy experiments. It is for this reason that while they had rubrics in place, they also saw it was important to let teams run loose. The innovators in the room were curious to get Thompson’s thoughts on what’s next in terms of innovative technology. Thompson explained that, for one, it is good to see a growing skepticism surrounding technology. She is excited that the next generation appears to be focused on technology being good for humanity. Thompson thinks there are opportunities for disruption in the fields of personal finance, logistics of shipping and transportation, and sustainability. And her personal favorite, dog-related startups, too. As the discussion neared an end, Thompson left students with some words of wisdom: “you’re only going to be great at something if you’re excited about it.” Along these lines, Thompson stressed the importance of pursuing things you’re excited about with people you respect and who you have shared values with and enjoy working with.